The three pillars of sustainable development (social responsibility, environmental protection and economic viability) are also called the "Triple Bottom Line", a concept that was first introduced by John Elkington in the book Cannibal with Forks (1998). 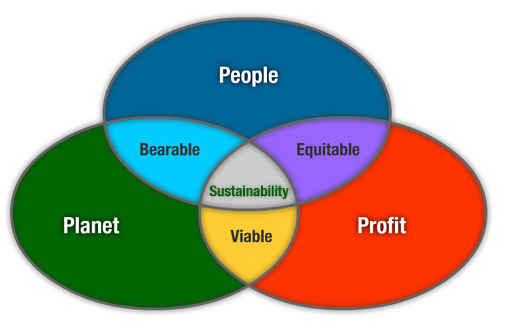 This is also known as the 3 Ps of sustainability - people, planet, profit. Diagram as introduced by John Elkington. We are spezialized in helping your hotel or F&B operation to effectively use all three pillars of sustainability, so that you can be profitable for a long time to come - plus the earth and your community can profit too! We have also developed tools, and will support your efforts with a customized coaching program. Triple bottom line reporting plays a big role in the context of sustainable development, but is a really complex and expensive process. We have developped a simnple format that enables smaller and mid-sized hotel- and restaurant operations the use of triple bottom line reporting as an essential part of their Corporate Responsibility program.